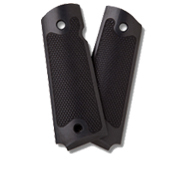 The simplicity of the satin finished 1911 Standard Smooth Grip is evident at first glance. The ability to match or contrast the grip color with the gun finish, adds versatility to your choice. Made to exacting fit and finish specifications, its simple, clean and uninterrupted lines might be the one for you. 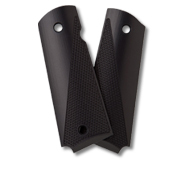 New 1911 slimline checkered grips offer the same stability as the standard grips with the added benefit of a thinner grip and a lighter overall weight. If you are changing out your standard thickness grips, please visit our Accessories page to view the choices of slimline bushings and screws that we offer. 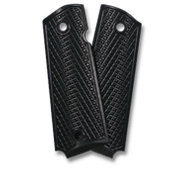 In the 1911 Standard Checkered Grip you will have the strength and durability inherent in the aluminum grip, combined with an overall checkered pattern. Checkering has been a generally accepted method of adding stability in the hand to a pistol grip, and this design does it beautifully. The 1911 Deluxe Checkered Grip takes all the utility and durability found in the Standard Checkered Grip and adds a touch of class with its embedded design. 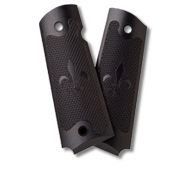 Found in the checkered pattern, the Fleur-de-lis is added before the color anodizing is applied. 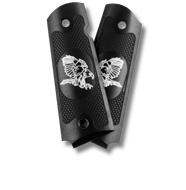 The result is a grip anyone would be proud to wear on their 1911. The Grater Grip is designed to fill the niche of shooters that want the most aggressive purchase, hand to grip, available in the marketplace today. The most significant difference in the Grater Grip is created by the shape of the tool used to machine the grooves. In addition there is a difference in the centerline of the troughs as opposed to our standard checkering. The 1911 Desert Digital Series grips are the best of all our options. Standard features on these grips include, being cut for an ambi safety, more aggressive checkering and finished off with the very popular complete coverage checkering pattern. 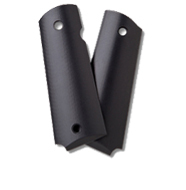 In addition to these features, all the full-size standard thickness grips are also lightweight, meaning the backsides have been hollowed out to reduce weight. 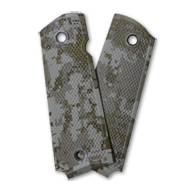 The grips are first finished with a Type III hard brown anodize and then coated with a desert digital pattern, applied by Oregon Hydrographics. 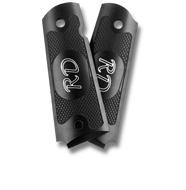 These Machine Engraved grips are another favorite of 1911 Deluxe Checkered group. 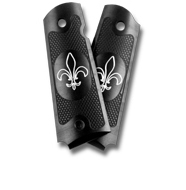 This series of grips consists of the Fleur-de-lis and the Swooping Eagle. The engraving is done with a sharp angled tool to produce a thin silver line of polished aluminum. Rich in appearance, this engraving process will last a lifetime. The Machine Engraved initials are a well known favorite of 1911 Deluxe Checkered group. The engraving is done with a sharp angled tool to produce a thin silver line of polished aluminum. Up to three initials can be engraved on the grips.The sample shown here is Lucidia Handwriting Italic font. Rich in appearance, this engraving is second to none.